Explicitly excluded from the labour law and often working in isolation, the shepherds and farmworkers who help feed Saudi Arabia endure dangerous working and living conditions. Puneeth and Damodar travelled to Saudi Arabia to work as car painters. When they arrived, their sponsor confiscated their belongings, including their passports, and forced them to herd sheep. They were promised a salary of SR 1800 (USD 480) when they were recruited in India, but were not paid a single riyal by their sponsor. They became forced labourers, receiving only food as remuneration. Puneeth and Damodar repeatedly protested and pleaded to their sponsor to be sent back to India, but he refused. Their experience is not an isolated case. The kafala (sponsorship) system gives sponsors disproportionate power over all migrant workers and the Saudi legal system lacks efficient redressal mechanisms for labour disputes. Contract substitution is common, so is salary reduction or withholding. Farmworkers and shepherds are furthermore explicitly excluded from the Saudi labour code, making them acutely vulnerable to exploitation. Workers of agricultural and pastoral firms that employ ten or more workers were once included under the 2005 Labour Law, but amendments to the law in 2015 removed coverage for all such workers. There are currently no plans by the Saudi government to incorporate agricultural workers and shepherds into the labour code. Despite a mostly barren landscape, the Saudi government has invested heavily in growing its agriculture sector since the 1950s. Today, it is estimated that agricultural farms occupy a space close to 30,000 square km, roughly three times the size of Qatar. Saudi Arabia produces 14% of the world market share of dates from over a 25 million palm trees, concentrated mainly in al-Qatif, al-Qasim and the western coast. Saudi farms reportedly produce up to 90% of the kingdom’s consumption of vegetables and 60% of the kingdom’s consumption of fruits. Livestock is also a dominant sector of the Saudi economy and imports (they are imported and then raised in Saudi). Sheep, goat, and camel herding have historically comprised an integral part of the country's nomadic culture, and the kingdom is among the highest consumers per capita for sheep meat in the world. At least 2 million sheep are slaughtered during the Hajj season each year, with at least one-third of the demand produced locally. According to the Saudi General Authority of Statistics, 650,000 migrants worked in the agricultural sector as a whole in 2015. This number includes highly trained technicians, veterinarians and other professionals, as well as farmworkers. The share of shepherds and farm workers is not indicated in publically available statistics. In any case, many of these workers are irregular and would be excluded from official statistics. Due to onerous working conditions and meagre pay, almost no Saudis work as shepherds or farmworkers. When the Ministry of Labour and Social Development (MoLSD) proposed that shepherd jobs be Saudised, a local newspaper mocked the suggestion and told the MoLSD to focus on finding real jobs for citizens. In an interview with a local TV station, a Saudi farm owner said that it is “impossible” to find a Saudi willing to work on his farm. Thus, migrant farmworkers and shepherds are needed and they are often recruited through irregular channels. This is in part due to the high turnover; retention is low, with many workers running away, because many migrants are misled about the type of work they were hired to do, and because - even for those who knew they would be working in remote areas - the working conditions are unbearably harsh. Irregular recruitment includes contract substitution - hiring someone as a driver, for example, then forcing them to work as a shepherd or farmworker once they arrive in Saudi Arabia - or by hiring irregular migrant workers already residing in the country. Strict and ineffective regulations also play a role in driving the recruitment and employment process underground. First, the high cost of recruitment and visa fees associated with the kafala system, as stipulated in the Saudi Residency Law and the Ministry of Interior (MOI) regulations, incentivizes small and medium-sized business owners to use irregular channels. Sabq, a popular Saudi online news media outlet, published a report on runaway shepherds in Ramadan of 2015. The workers are accused of breaking the law and condemned as criminals. However, there is no mention of the harsh working conditions or low salaries that likely lead workers to run away. In fact, many employers admit that shepherds who escaped have probably found a better salary with another employer. Markets operate at full capacity during Ramadan, meaning many employers need additional manpower. That those other employers who the shepherds escape to are themselves Saudis is never mentioned in such reports. Nor do the reports indicate that the market is determining a higher price for the salary of shepherds (the market often being an excuse the government uses to oppose minimum wages), or the fact that employers are intentionally undervaluing the work of their employees. In the report, only the runaway shepherds are portrayed as money-hungry – not the employers seeking to maximize profits by paying low salaries. Second, dealing with the bureaucracy of Saudi ministries can be both taxing and time-consuming. Unlike other sectors, a farm or livestock owner is required to obtain approval from the Ministry of Environment, Water and Agriculture (MEWA) in order to recruit shepherds or farm workers through the MoLSD. An employer is also required to obtain a “veterinary health” certificate and wait six months after the certificate is issued to hire workers. This waiting period drives many employers to hire undocumented migrants. MEWA regulations also stipulate that livestock owners must own at least 150 sheep or 25 camels or cows in order to obtain approval to hire workers. As for farm owners, their farms, whether rented or owned, must have at least 100 palm trees or span at least 20 dunams (20,000 square meters). Employers who own less than the required number of livestock or trees will therefore pursue irregular recruitment and employment. Third, according to Sadiq al-Ramadan, the head of the farming committee in the agricultural city of al-Hasa’s chambers of commerce, the number of available legal seasonal workers is very limited during the harvest season of dates, tomatoes and potatoes. For some businesses, such as olive farms in al-Qurayat and flower farms in al-Taif, legal seasonal workers are almost impossible to find. This situation, al-Ramadan says, leads many farm owners to illegally recruit workers during the harvest season, which can last up to six months. Al-Ramadan holds the MoLSD responsible for this underground market since the Ministry’s regulations do not offer employers legal or realistic means to recruit seasonal workers. The cost of hiring and employing legal seasonal workers, if available, can reach up to a staggering SR 3500 (USD 933) per month, much higher than the cost of recruiting and employing irregular workers. Finally, for farm and livestock owners, the more workers they hire, the higher the cost incurred. According to the regulations of the MoLSD, hiring more than four workers requires an employer to apply for a commercial permit (SR 800/USD 213) and register as a business (even if the owner does not intend to engage in business). Once they register as a business, they have to comply with the MoLSD Nitaqat rules, which require businesses to hire a certain percentage of Saudi employees. Since almost no Saudis are available for those jobs, businesses resort to hiring no-show Saudis (the ones who are on the payroll, but do not actually do the work) at a considerable cost. As such, misguided government regulations contribute to the demand for undocumented shepherds and farm workers. Poorly enforced human trafficking laws and limited access to justice for migrant labourers exacerbate the situation and often puts these undocumented workers in tenuous positions. Similar to Puneeth and Damodar’s case, many workers go to Gulf expecting to work as mechanics, drivers or electricians only to find themselves subjected to forced labour in isolated farms or looking after livestock in the desert or remote mountainous areas. Many are also smuggled across the borders from neighbouring Gulf countries. Mohammed Omar, an Indian migrant, was taken by his Qatari sponsor across the border into Saudi Arabia to work as a shepherd. Omar worked long days without pay and without a day off. As detailed by Arab News, many sponsors do not issue an iqama (residency permit) to farm workers and shepherds in isolated areas in order to prevent them from running away, increasing their vulnerability. Without an iqama, migrant workers, including those who entered Saudi Arabia with a valid visa, are forced into irregularity and criminalised under Saudi law. Their undocumented status renders them vulnerable to arrest by Saudi security forces whose raids at times specifically target farms and livestock markets. If a worker is arrested with no Iqama, he or she will be deported unless they can prove their legal status. Those who prove their legal status are still required to pay a penalty for not carrying an iqama. The penalty ranges from SR 500 to SR 3000 in addition to weeks in detention. After being released from detention centres, workers with valid visas are still subject to arrest if their sponsors do not issue an iqama for them. If a migrant worker with a valid visa is arrested for the third time for not obtaining an iqama, he or she will be deported as per MoI regulations. Most shepherds and farm workers in isolated areas lack access to basic amenities such as running water, electricity and safe shelter. Togeti Anantagiri, who went to Saudi Arabia to work as a driver but was forced to work as a shepherd, said that “safe drinking water was a distant dream” for him during his seven months in Saudi. He developed kidney problems after regularly consuming water used for animal feed. Shepherds are often stationed in the desert or mountainous areas. They live in tents or portable houses that cannot endure sandstorms, thunderstorms or extreme weather. Shepherds’ deaths due to inadequate protection from extreme weather and natural disasters are regularly reported in Saudi media. Kattayadan Subair, who was forced to work as a shepherd in a remote area of the desert, told Human Rights Watch that his lodging was unsuitable for human survival, adding that “the heat was so intense that it burned the hair on my body, and in the winter it was so cold that the water turned to ice." Subair tried to run away but he was unlucky; his sponsor caught him, beat him badly and returned him to work. Al-Weeam newspaper reported that a sandstorm hit a shepherd’s portable room, causing it to collapse on him and kill him instantly. Another shepherd was reported dead after he drowned in rainwater that flooded the wadi where he had put up his tent. Stories of shepherds dying or severely injured due to extreme heat and dehydration, cold weather, or lightning strikes are common. Yet, what makes it into local media is likely only a small percentage of incidents, and the coverage that is received is problematic; their deaths are most often portrayed as natural acts of God. Workers die because of heat, cold, flood or lightning strikes - with no mention of the absence of adequate accommodation and reasonable protection from the elements. The deaths are rarely attributed to the negligence and exploitation of sponsors or the absence of enforced regulations requiring employers to offer safe working and living conditions. It's not only unpredictable weather that endangers workers. Attacks by wolves, dogs, snakes and scorpions are an everyday challenge for shepherds. So too are attacks by their own livestock, especially camels. Shepherds working in the northeastern part of the country are exposed to areas riddled with mines and undetonated bombs left over from the First Gulf War. Accounts of shepherds dying or severely wounded by undetected mines and bombs are reported every year. Dangerous working conditions are all the more life threatening due to shepherds' and farmworkers' isolated environments. Whether roaming the desert or confined to their sponsor's farm, the remote areas they inhabit often lack strong cell-phone signals, if any at all. Limited access to communication and to medical care leads to preventable deaths, including by heart attacks starvation or dehydration. Recounting his experience in an isolated desert area near the Saudi-UAE border, Anantagiri said he spent his nights killing scorpions and snakes in his makeshift room before going to sleep. Despite his meticulous efforts, he got bit by a scorpion one night. Having called his sponsor numerous times with no response, he decided to run for his life. After running for hours, he reached a highway and collapsed. A Pakistani driver picked him up and took him to a hospital where he received medical treatment. A similar incident surfaced on social media in July 2017. A video shows a group of Saudis who stumbled upon a shepherd on the verge of dying due to dehydration. The group was able to give him water and food and - by luck - save his life. While these shepherds survived, many others were unlucky. 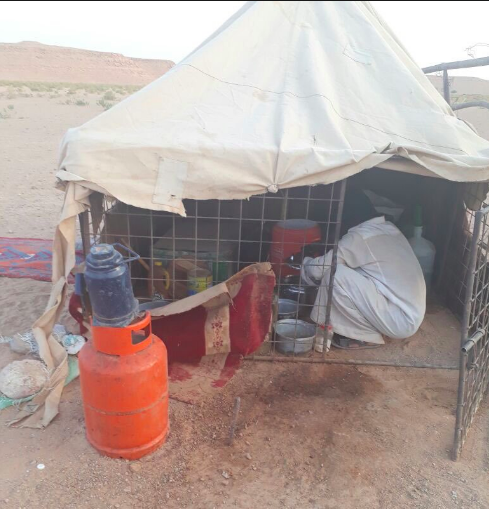 Between April 2005 and May 2006, Okaz newspaper reported that 41 bodies of migrant workers were found in the arid grazing fields surrounding the town of Ranya. There are no statistics available on the number of shepherd deaths in the kingdom annually, but it bears mentioning that the Ranya desert constitutes only a small portion of the large swaths of Saudi desert, where thousands of shepherds tend to thousands of camels, sheep, and goats. The bodies of dead shepherds are often found by other shepherds, a foreboding reminder that they could be next. Saudi media has reported on dozens of shepherds and farm workers suicides in recent years. Most reports claim local authorities 'are investigating these incidents.' Yet, the results of investigations are never reported. As previous independent investigations have shown, migrant suicides are often the result of abuse and poor living and working conditions. Like domestic workers, the lives of shepherds and farm workers are plagued by social isolation, which is strongly linked to suicide. As noted throughout, Saudi media reporting tends to absolve Saudi sponsors and the government from responsibility for the deaths and suffering of shepherds and farmers. Their deaths and injuries are accepted as ‘God’s will’ or the inevitable outcome of workers’ desperation for employment. Aside from these narratives, Saudi media also tends to both idealise their secluded lifestyle and condemn their work ethic in the market or farms. Migrant shepherds secluded lifestyle is often praised, as it signals purity of the soul and preservation of Arab traditions. Most importantly, it pays homage to the life of Prophet Muhammad, who worked as a shepherd and spent much of his youth alone, contemplating nature and attempting to unlock the meanings of life. This al-Watan report glorifies the profession, glossing over the harsh working conditions of contemporary shepherds. The reporter does not mention or ask the shepherds how they cope with lack of access to water and other basic essentials or the environmental dangers. When Salim Baker, an Indian shepherd, was asked 'how things are' by al-Watan newspaper, he replied “I got used to things except for sandstorms. There is no solution to those … I came here to earn a living and therefore I am willing to endure all the difficulties here.” Abu al-Hasan told the same reporter that he copes by remembering the Prophet Muhammad's words for those who fast Ramadan. Abu Hasan's story is narrated such that readers praise his perseverance, but stop short from recognizing the avoidable injustices that rule shepherds' lives. However, shepherds are only praised in the media when they are sequestered, far away from society. When they show up in livestock markets, media outlets often demonise them. Foreign shepherds are accused of colluding with each other in order to raise the price of livestock sold at market. Shepherds, like many other migrant groups, are portrayed as a “mafia,” unified together to prevent any Saudi farmers from selling their livestock. This is often a misleading line of reporting, as migrant shepherds are most likely selling livestock on behalf of their Saudi sponsors. The majority of them do not own livestock of their own. Farmworkers are portrayed negatively as well. A headline in Okaz newspaper reads “[foreign] workers poison fruits and vegetables and assassinate the soil,” in reference to farmers using chemicals and pesticides to grow crops. Other headlines accuse farmworkers of using sewage water to water their plants. As with the shepherds and livestock, it is highly unlikely that these farmers own their farms or the crops. The allegations of pesticides, sewage water usage would most likely be provided to them by their Saudi sponsors, or at the very least used with their knowledge and consent. This is not mentioned or alluded to in the reports. This is not to say that the Saudi public and civil society as it stands are not aware of the onerous conditions shepherds endure. Local offices of the Ministry of Islamic Affairs spread awareness about shepherds' suffering during the winter, asking citizens to donate winter clothes and blankets. In addition to the Ministry’s efforts, high schools, colleges, boy scouts groups, and charity organizations lead their own campaign to provide winter clothes, blankets, and other winter essentials to shepherds across various parts of the country. While those charity measures are commendable, they only offer a temporary workaround to systemic issues. Despite restrictions, Saudi civil society (charities and social media) is a critical avenue for raising awareness about, and advocating for, migrant rights. If given more freedom and protection, Saudi civil society could be a great ally for migrant workers. Nations Don’t Build Themselves. People Do.